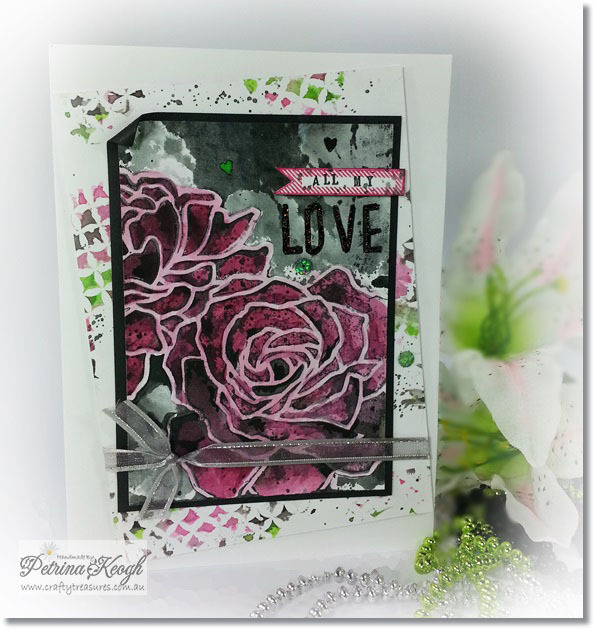 Hi there crafty friends, I had so much fun making a few cards for this weeks Splitcoast Stampers – Technique Challenge (TLC520) Embossing Folder Stamping. I utilized three wonderful embossing folder designs, the first EF by Stampin’ Up! – Manhattan Flower, the second EF is Darice – Birds In Branches and the third EF is by Couture Creations – The Marriot Collection. I did not plan three, I just got playing and had a ball, but got to busy to finish them up and mount them until today and this was the end result. Firstly… with this card, it has not been embossed through an embossing machine, it is flat with no raised areas. I inked up the folder with black ink, lightly spritzed but decided to lay a piece of acetate onto the folder for something a little different, wondering what sort of result I might end up with? I was dubious, but kept on playing! The inked pooled more blotchy or blob like and I was liking it at this stage, so I laid my cardstock on the embossing folder and lightly ran my hand over and waited a little for all that goodness to absorb then turned it over… Nice Murial! I then coloured up the roses with an old set of Sakura watercolours, I forgot I even had this small set! It was easier than it probably looks, all I did was wash the roses with soft pink and then added darker shade of the same colour to the petals. I still had some residual ink on the embossing folder so I lightly spritzed again and repeated the same steps above with the embossing folder, carefully realigning the card stock back onto the folder, which added the softer grey and more lovely blotches. My second card also has not been embossed through an embossing machine, it is flat with no raised areas. 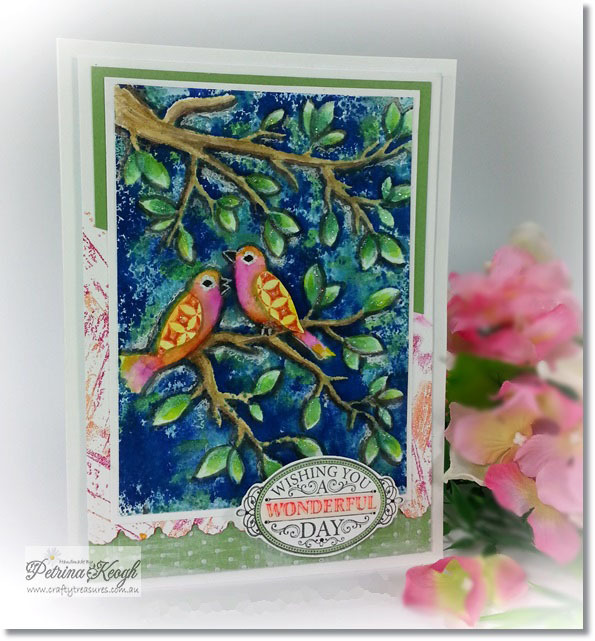 Using the Darice – Birds In Branches embossing folder and three different dye based inks, I inked one after another and realigning the same as my first card. With Marvy – Le Plume Markers and a water brush, I coloured the birds, tree limbs and leaves. I cut additional wing detail and stamped them both with the Marocco clear stamp and adhered them with foam adhesive. To shade the underside of the branches and leaves I used Sakura watercolours. I finished it off with a lovely HOTP sentiment, highlighted with a coat of diamond glaze on the middle word “wonderful”. 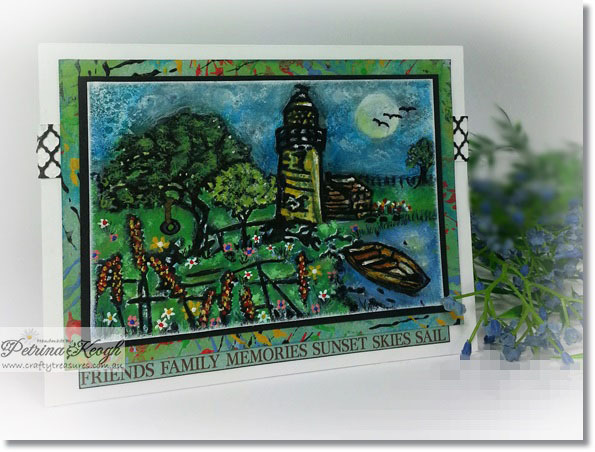 For this final card I used 2 shades of blue ink and applied separately using the same steps as my first card. I finally succumbed to embossing this one in the embossing machine and swiped the black ink pad over the surface and painted it with acrylic paints adding details like the Tyre swing, moon, clouds, fence, birds, a few flowers, grass and a foreground tree… of course! For the the background I distressed a piece of white cardstock with acrylic paints to suit the finished image. Actually while working with this one, both trees on the left hand side of the lighthouse, I had accidentally coloured them both as one tree, across to the lighthouse, until I found there was another smaller tree tucked in there, all fixed!